A mum of five has been reunited with a team of King’s Lynn-based paramedics who saved her life. Forty-seven-year-old Ada Gray Holman’s heart stopped beating for around 33 minutes after she went into cardiac arrest but the combined actions of her quick-thinking partner and the swift arrival of paramedics saved her life and she has been able to thank them personally. 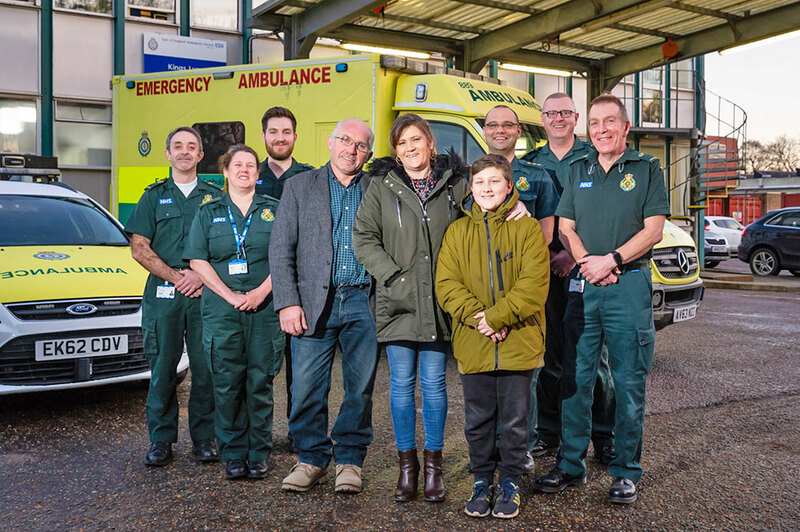 Mrs Gray Holman, her son Michael, 11, and partner Jim Harper said thank you to five of her six life savers when they met on Monday at Lynn ambulance station. The grandmother of 12 has no recollection of her traumatic ordeal and said it had been a bit upsetting hearing what had happened after she collapsed at their Weasenham home in the early hours of January 5. The East of England Ambulance Service paramedics said it was rare for someone to survive such an attack and they praised Mr Harper, 49, who had carried out chest compressions having only ever seen it done on television. Critical care paramedic Carl Smith said Mr Harper had saved his partner’s life by immediately starting the compressions and continuing until paramedics arrived in around 15 minutes. First on the scene was student paramedic Jonathon Hall and colleague Gary Smith who were at Fakenham. They were followed by Carl Smith and Tony Chisam, and then Gemma Proudfoot and Dave O’Callaghan. Carl said Mrs Gray Holman owed her life to a “chain of survival” in which Mr Harper’s intervention had been vital. “Weasenham isn’t a great location for ambulance access but the good response time and the quick intervention of Jim was so important,” he said. “She would have died without Jim’s intervention. Because of his good CPR we were able to put a defibrillator on her chest. He had kept a good rhythm going. Mrs Gray Holman, who has suffered three heart attacks in four years, said this had been the worst attack and the first time she had lost consciousness. She had felt unwell but thought it was indigestion. Around 4am Mr Harper said he gave her some Gaviscon and when the pain continued he fetched her heart spray but she went into cardiac arrest. “She picked up the spray but didn’t even get it to her mouth. I picked up the phone to call for help and started CPR. I kept going until these guys arrived,” said Mr Harper, who brushed aside his life-saving action. “You just deal with it. I wasn’t giving up in a hurry,” he said in the wake of the praise. The paramedics faced what they described as a “challenging” 45 minutes as they tried to stabilise Mrs Gray Holman, who went into cardiac arrest again before they were able to take her to a special centre at the Norfolk and Norwich University Hospital. After leaving the hospital, Carl left his number with Mr Harper who contacted him a few days later with the good news. Mr Chisam said it was lovely to see the family. “A lot of things came together on the day for the right outcome,” he said. Gary Smith said it was a “rare opportunity” to meet a survivor. Mrs Gray Holman spent two weeks in hospital and still has regular check-ups. “I do feel a lot better but I still don’t remember anything about it,” she said.